A new luxury edition of the Samsung Gear S2 smartwatch made by de Grisogono has just been unveiled, and the looks and specs are definitely impressive. The Gear S2 has been blinged-up into a limited-edition jewelry watch, featuring an impressive number of black and white diamonds (more than 100), an elegant black bracelet, and a shiny rose gold bezel. Even though the new bezel is encrusted with black and white diamonds, it has retained the rotating functionality of aiding in navigating through the menus of the smartwatch. The original vanilla Gear S2 was the one to introduce this rotating bezel, but the new, diamond-encrusted version seems to add the style to the usefulness. With the new exclusive Gear S2 edition, consumers are invited to enjoy a luxurious device as well as a fashion piece, both boasting unique aesthetics. 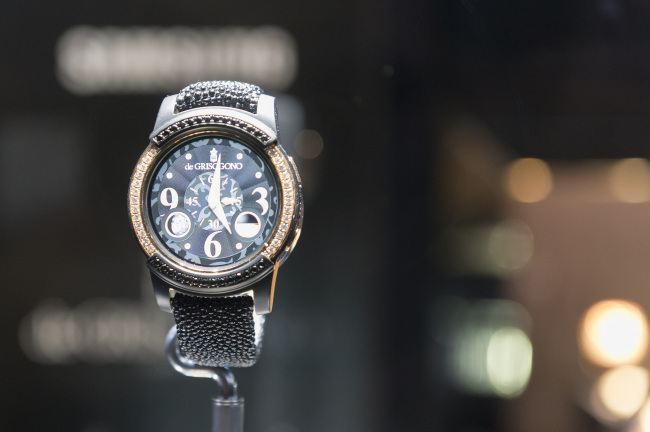 While the new Samsung Gear S2 by de Grisogono has clearly maintained its intuitive usage and technological capabilities, the new model is focused on embodying the “boldness in watch design and our jewellery savoir-faire,” said Gruosi. At this point, pricing details have yet to be disclosed, but it’s safe to assume that a luxurious piece such as the Samsung Gear S2 by de Grosogono will not come cheap. Although the two companies did not even offer a ballpark figure for the fancy gadget, they did note the special edition will start selling sometimes his summer. For those who will afford the limited edition Gear S2, Samsung retail outlets and de Grisogono stores will both sell them. Apart from the eye-grabbing diamond-encrusted finish, the specifications of the new Samsung Gear S2 are pretty much the same. Therefore, it features a 1.2-inch circular Super AMOLED touchscreen with a 360 x 360-pixel resolution, 512 MB of RAM and 4 GB of internal storage, and Exynos 3250 dual chipset. It also sports a heart rate monitor, Bluetooth, a 250 mAh battery, Wi-Fi, and Tizen OS. The original version of the Gear S2 had sparked a lot of interest, as the clean design neatly integrates the smart features without bulking its looks. Even though the new de Grisogono is definitely even better than the original, it’s not exactly for everyone. As we get closer to launch, the two companies will release more info about the pricing and the number of units available.